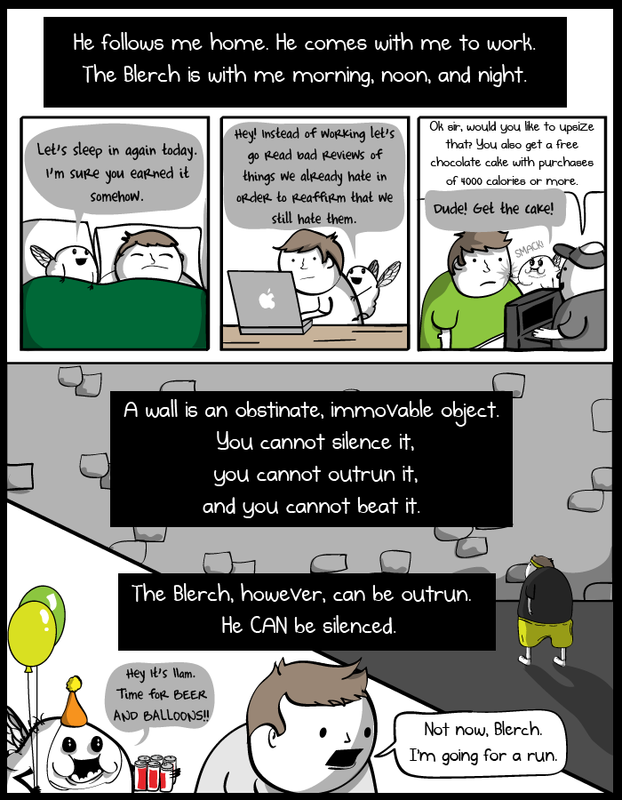 The Oatmeal, a wonderful online comic, recently posted a hilarious multi-page story about the author's reasons for running long distances. Why fear The Wall, when you are constantly plagued by The Blerch, a pint-sized virtual troll that represents all that is apathy, gluttony, and indifference (and happens to also be the sound of any condiment that is squeezed out of a plastic container)? Definitely worth a giggle - be sure to click through and give it a read! Wow. Funny, sad, piercing,all at the same time. This man knows his inner demons by name! And can still laugh at himself and them, while he runs to slay the kraken and outpace the bleaccchh, for a few moments. He captures the onlookers perfectly (not Gladiator,again! eech, what is that thing?). And I LOVE that he runs to eat and yet embraces the moments of nirvana when they come out of the pain. Captures the agony, the ecstasy, and the hilarity of life. A+ Thanks for sharing. I saw that elsewhere and had a good laugh. I really saw myself in the cartoon which is both a positive and negative I suppose. Thanks for posting. I love the oatmeal. Especially the "State of the internet" series!